What does it mean to be a perfectionist? It is easy to believe that those who classify as a perfectionist are on track to become perfect, but that is far from the truth. Being a perfectionist isn’t necessarily about things being “perfect”, but needing to be and striving for it at any cost. For example, a perfectionist may hold beliefs such as “I am not okay as I am”, “No matter what I achieve, there is always more”, or “If I don’t meet this goal, I have failed”. 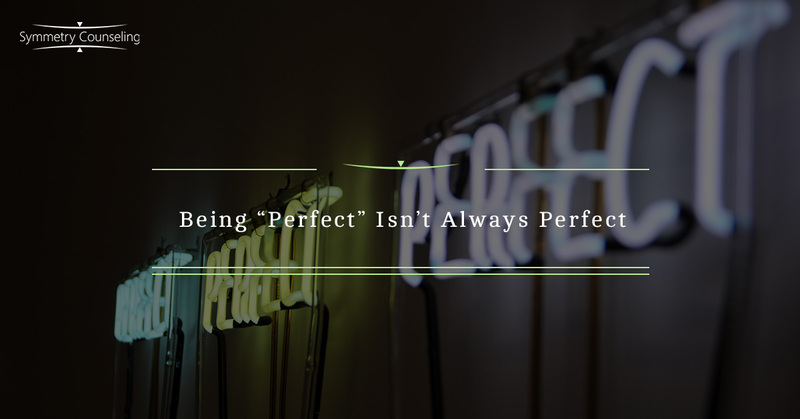 A recent article in The Atlantic titled “The Problem With Being Perfect”, discussed Dr. Jessica Pryor’s perspective on perfectionism and her drive to increase awareness of how this mindset can be damaging to one’s mental health. While perfectionism is a trait that many people deem a strength or motivator, it can sometimes be a curse that perfectionist expert, Dr. Jessica Pryor, states can lead to depression, anxiety, and even suicidal ideations. While it can be a trait that is used to motivate and drive, it is important to know how it can be used in maladaptive ways as well. Below are some ways perfectionism can impact your life in a not so perfect way. Those struggling to be perfect often want their relationship to be viewed as perfect as well. They may begin to project the same high and unrealistic expectations, demands, and criticisms they have for themselves onto their partner. Their partner may begin to feel unappreciated, inadequate, and pressured while the perfectionist continues to feel disappointed. A continuation of this cycle may eventually push romantic partners away as they never feel good enough. A perfectionist’s friendships are affected as well as they rarely take priority over the things the perfectionist needs to accomplish. They may commonly say “no” to invitations, compete with friends, and have high expectations for them as well. Constantly telling yourself you aren’t good enough is undoubtedly going to lead to low self-esteem. Some common thoughts perfectionists say to themselves include, “You are a failure”, “Working hard isn’t enough, you have to succeed”, or “You’re not enough”. Over time, this depreciating thinking will begin to wear and you tend to have constant self-doubt, insecurity, and disappointment in yourself. It is important to work on challenging these negative thoughts and belief systems as they can lead to symptoms of depression. Trying to keep up with the high expectations that tend to constantly rise will create some anxiety. It will become more of a challenge to meet these expectations and worries when thoughts such as “What if I don’t succeed” and “I am going to fail” become stronger and more frequent. Perfectionists will always have a constant feeling of anxiety as there is always something to be accomplished, but it can increase over time. Their response to this anxiety is unfortunately to keep working harder and harder until they succeed at any cost. This leaves them in the vicious cycle of anxiety, insecurity, and heartbreak until something changes. If you identify as a perfectionist, are struggling with some of these issues, and would like some support, it may be useful to connect with a therapist. Contact Symmetry Counseling at 312-578-9990 to set up an appointment with one of our very skilled therapists today!